Bruno | Brown Plastic Surgery is committed to researching and providing our customers with the best skincare and anti-aging products on the market. 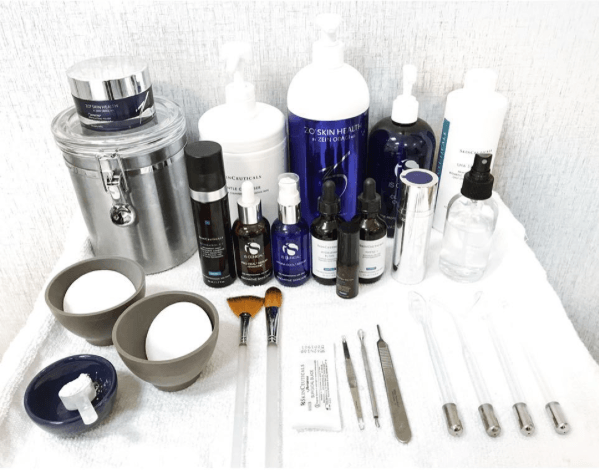 Sara will evaluate your skin and make recommendations for products she feels will best serve your skin type and lifestyle, as well as complimenting your in-office treatments to have the most effective and comprehensive healthy skin routine possible. Read below for more information about each product. Born from decades of skin cancer research that led to pivotal breakthroughs in antioxidants, Skinceuticals’ high potency formulas are concentrated in pure actives and proven to penetrate optimally into skin. Made in the USA, Skinceuticals’ clinical skincare is used by dermatologists, plastic surgeons, and medi-spas for daily homecare and to complement aesthetic procedures. Skinceuticals is formulated to correct signs of aging, protect healthy skin and prevent future damage. Dr. Obagi’s philosophy is to create & maintain healthy skin for life – for all patients, and their products are formulated and developed to do just that. Guided by Dr. Zein Obagi, a practicing dermatologist, the ZO product development team is constantly sourcing new ingredients and formulating products that will provide patients with visible results. The dynamic bond between science and skin health is the essence of ZO Skin Health, Inc. Their comprehensive and continuous work in skin health solutions utilizes the best of what science has to offer to improve skin’s natural functions that prevent or resolve many disorders. ZO looks to science for developing products that create and maintain healthy skin for life. What sets Innovative Skincare® apart is their commitment to offering clinically-proven, superior products, featuring the most advanced technology, and utilizing only the highest-grade ingredients available – thus creating formulas that encourage dramatic physiological improvements in skin health and appearance. Backed by countless independent third-party clinical studies, the performance of iS Clinical products has been well documented. Innovative Skincare® has assembled a world-class team of experts including renowned pharmacologists, geneticists, biologists and physicians responsible for some of today’s greatest advances in the fields of skincare and anti-aging medicine. After identifying the causes of key skin concerns, NEOCUTIS then sources specific ingredients to create unique formulas for optimal results. If an ingredient does not exist to address a particular skin concern, NEOCUTIS scientists use their skincare expertise to develop novel, benefits-driven ingredients. NEOCUTIS has patented several proprietary ingredients, such as NEO•PEPTIDE 7.5 in its MPC technology, to offer novel skincare solutions. NEOCUTIS consumers can be assured that the products they invest in will truly deliver desired benefits and a luxurious skincare experience. Now Jane Iredale has a full line of makeup that helps you achieve a beautiful complexion that is naturally radiant. High-performing mineral cosmetics provide effective skincare benefits as they finish your look with modern, wearable color and a soft-focus, luminous effect that brings your natural beauty to light.